Robinson Bungalows comes in at the low end of the bungalow price scale yet has a fabulous, quiet setting in its own little nook. Ad Book now! Rates from US$27.43++. Average rating 7.7 from 54 reviews. It mixes a backwoods feel with tropical beach -- the best of both worlds. 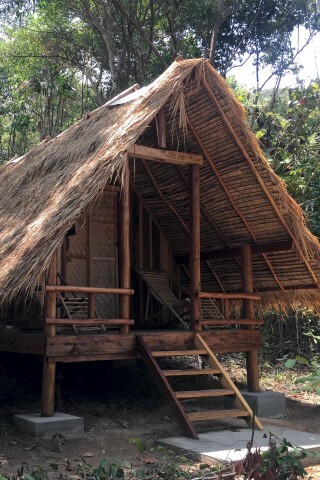 The 10 wood and thatch bedrooms are built at the edge of the jungle with sea views that make your heart sing and the sound of insects and monkeys to lull you to sleep. Most of the bungalows are on the shoreline, though a few are classed as ’jungle’ since they’re set back with less sweeping views. While we applaud the natural approach, the bungalows would benefit from some hooks and shelves to complement the mosquito net, bed and hammock they come with. Bathrooms are shared, so consider your bungalow’s location if you’re likely to need late night access. Generator-powered electricity runs from 18:00 to 23:00. Robinson’s restaurant is spacious and food prices are reasonable. There’s also a refill station for your water bottles. For the adventurous, there’s a reasonably difficult 45-minute jungle trek to Saracen Bay; the hills are steep to begin with, but it flattens out. From there, you can opt to do a much easier 20-minute walk to Lazy Beach, stay for a meal or sunset drinks, then catch a boat back for $5 per person. Be sure to check in advance with Lazy Beach that the boat is available, as it’s a long walk back. Snorkelling equipment is available for rent and there are opportunities for diving too -- The Dive Shop, which built Robinson’s, is located in the middle of the beach. Their pier makes for a postcard-worthy photo too, we think. It takes two and a half hours by slow boat to get to the property; The Dive Shop on Serendipity Road in Sihanoukville arranges boat transportation to Sunset Beach costing $20 return. If you take the fast boat to Saracen Bay from Sihanoukville you’d have to hike over through the jungle – this is potentially required in the rainy season in poor weather conditions according to their website -- but best avoided. Alternative places to kip on Koh Rong Samloem with the same sunset views and yellow sand are Huba Huba – five minutes’ walk at the other end of the bay, or more expensive Lazy Beach. Check rates at Robinson Bungalows on Booking.com.